In order to compensate my feeling of guilt being a Malaysian who loves her country much, I purposely surf the web for this - the every year theme for celebrating Hari Merdeka. Anyhow I like the theme of this year - Unity is the core of success. Yes, we want unity for Malaysians, not only talk about unity of certain races. This country is meant for ALL MALAYSIANS so every of us deserves BEING TREATED FAIR AND SQUAREl. Long live MALAYSIA! Long live MALAYSIAN! I love you so much that I blog meanwhile counting down to your birthday. 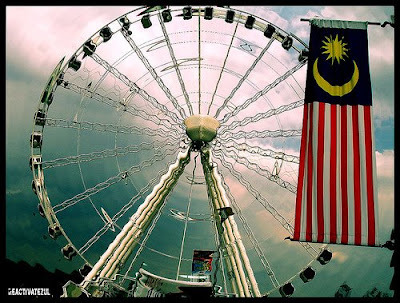 Happee Birthday Malaysia!~ You're 51!